AJ and Clint sailed to the Bahamas and I went back to Arkansas. My shoulder isn't doing well and I felt the time ticking away. I want to be ship shape in time for next cruising season so I can start life on the boat I spent 3 years building! So I departed and went back to Arkansas to start scheduling appointments and am still waiting on a surgery date. AJ and Clint departed for the Bahamas about a week after I left. They had a rough ride across the gulf stream. They left at 3am one stormy morning to claim the south wind shift and just missed the thunderstorm in Miami and in Bimini by minutes. They sailed the whole way in 30-40 knot winds and breaking ocean swell. AJ will write blog posts about the trip when he's back State side. Good times and bad times have been reported from the Bahamas. 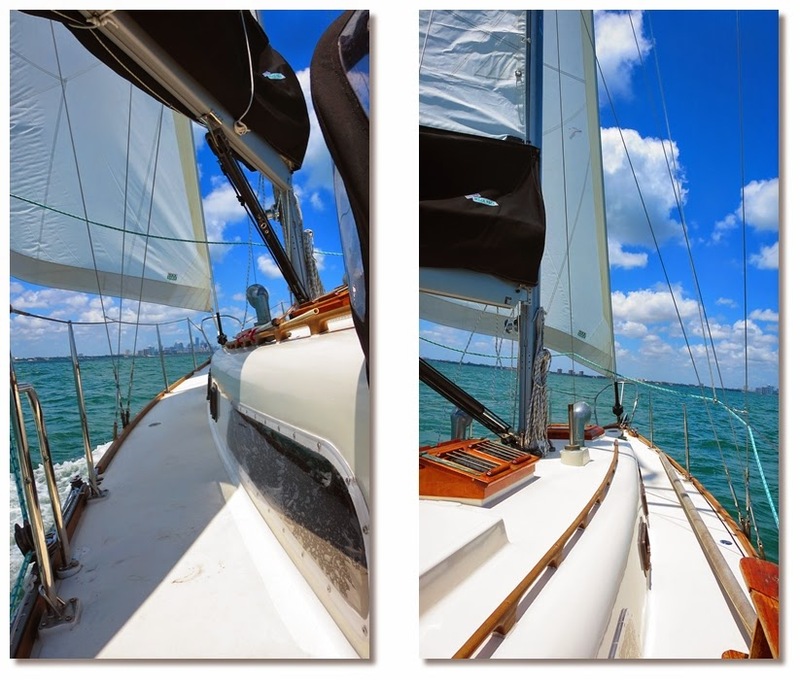 They arrived in Bimini where they spent about a week then sailed to Great Harbor Cay and the Berry Islands. From there they sailed south to Nassau which is where they are currently. Right now I believe they are planning a route back to Florida. AJ is in the process of deciding where to take the boat for the summer. I think we've changed our minds about going to Texas. Maybe maybe not... There are few things harder than making plans about where to go on a boat when. A plan rarely lasts more than a couple hours! Robin does needs new zincs and a bottom job, so it's first post refit haul out is in the near future. AJ says he's taken a lot of pictures in the Bahamas and they'll get posted with his blogs, but if you want a sneak peak he's posted a few on Facebook, Twitter, and Flickr (The Photo Gallery tab at the top of the blog). 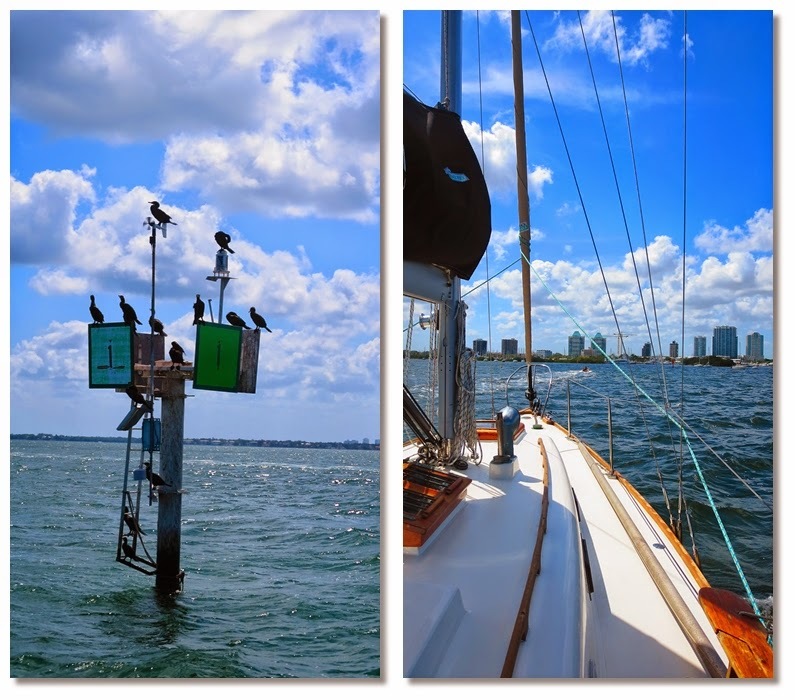 Here are a few pics of our time in Miami and sailing in the Biscayne Bay. Mooring field Coconut Grove Sailing Club. It was a bit tighter than we're used to! AJ and Clint. Clint's first and only sailing lesson before crossing the gulf stream.